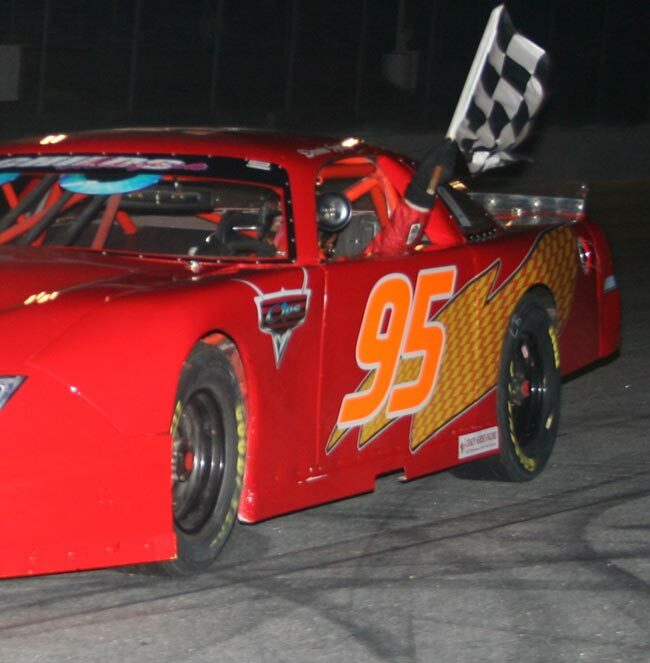 OXFORD, Maine - The reborn paint scheme of motion picture race car Lightning McQueen caught just about every fan's eye when Dennis Spencer Jr. rolled onto the track Saturday night at Oxford Plains Speedway. As for Spencer, he thought the prettiest sight of the evening was the one in his rear-view mirror. 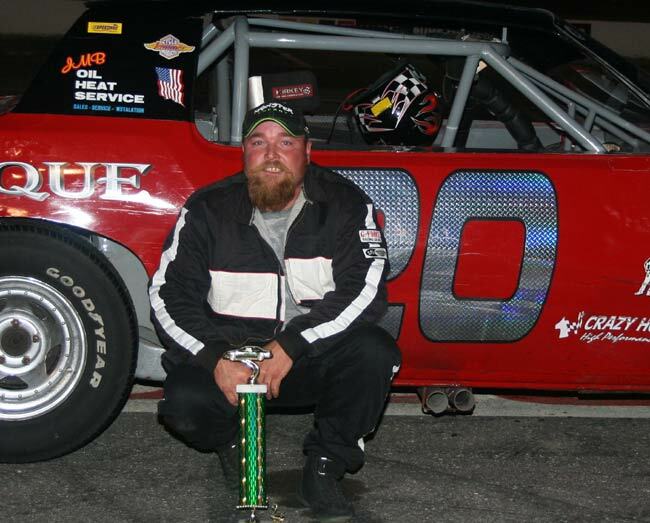 With Travis Stearns and Daren Ripley dicing it out side-by-side for some 20 laps and holding back Shawn Martin in the process, Spencer was untouchable on the way to his first 40-lap Oxford Networks Late Model victory of the season. 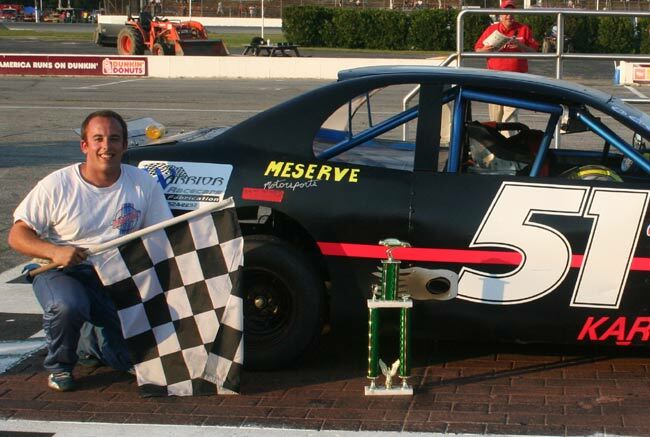 It was Spencer's 25th career checkered flag at the track where he began racing as a high school student in the early 1990s. Only 33 drivers have achieved that milestone. “I could see them going side-by-side in my mirror, so I stayed on the bottom and took it easy,” said Spencer. 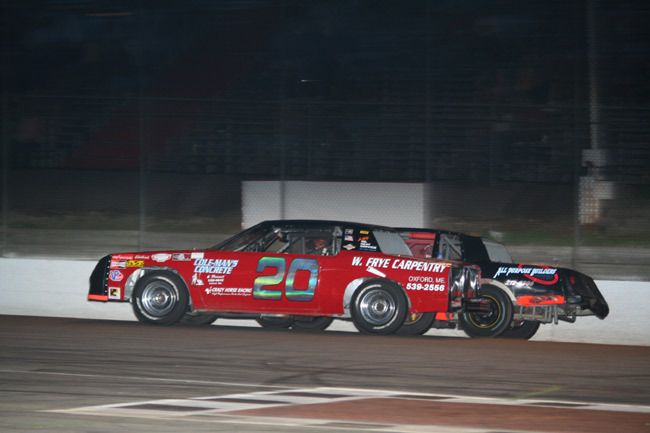 Twin 30-lap features for the Allen’s Coffee Flavored Brandy Mini Stock division provided the bookends for a busy program. 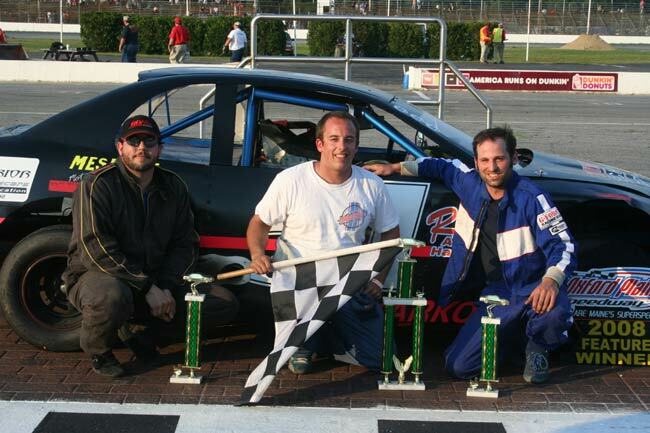 The same top three of Justin Karkos, Kevin Bishop and Ken Daigle Jr. appeared on the victory podium in each race. Karkos led the trio in that order for his division-leading fourth win of the season in the opener. 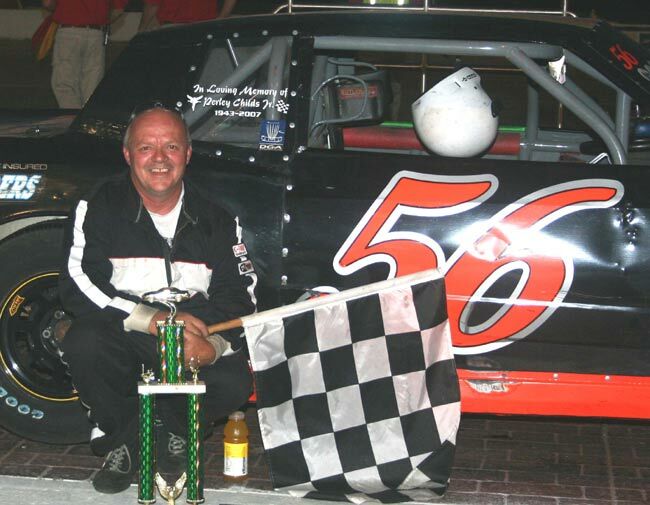 Daigle delivered his first career victory in the nightcap, one that met with a mixture of cheers and boos as he survived a run-in with Bill Childs Sr. and held off Karkos and Bishop in a late run to the finish. 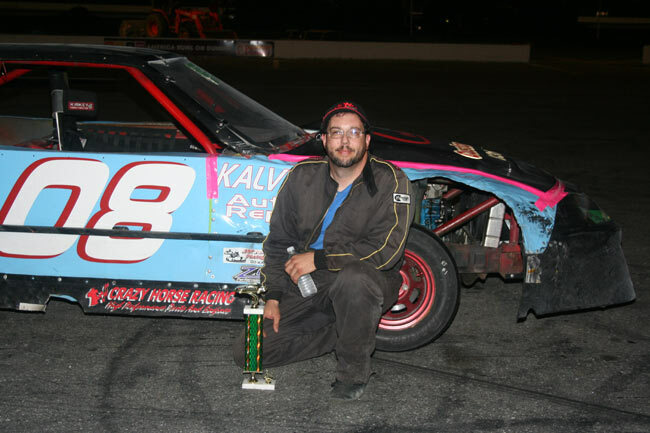 Mike Short continued his blistering mid-season pace with a hard-earned Allen’s Strictly Stock win, his fourth of the season. 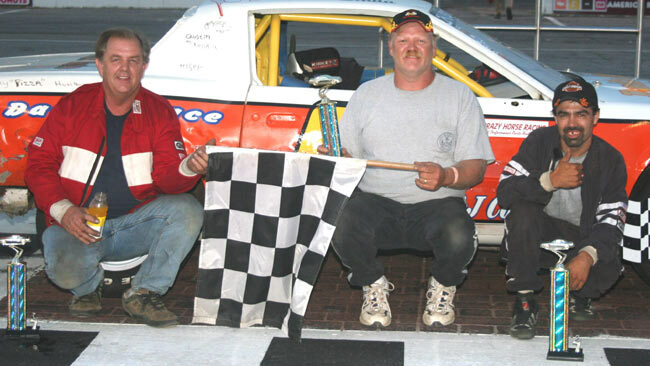 Jerry Goss and Steve Brill captured the 20-lap Chimney Tech Outlaw features. 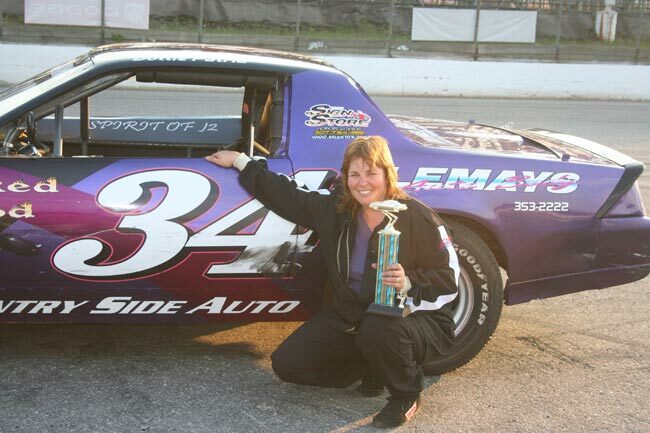 Vanna Brackett shared the Agren Appliance Saturday Showdown spotlight with a wire-to-wire win in the Allen’s Ladies division. 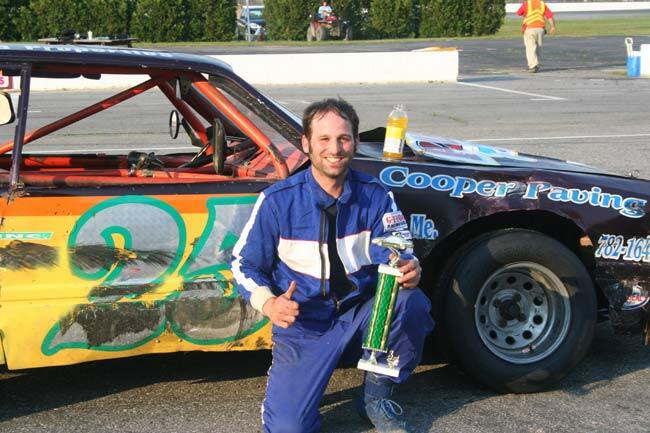 Venerable Russ Nutting, whose last previous OPS win came in 1985, emerged victorious in a 20-lap exhibition for the Wicked Good Vintage Racing Association. 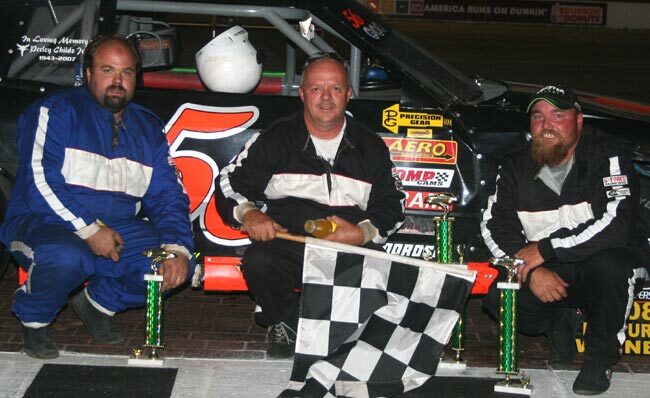 Spencer became the second different driver to win a Late Model feature for car owners Conrad and Kerrie Childs this season. Kurt Hewins accomplished the feat less than a month ago. 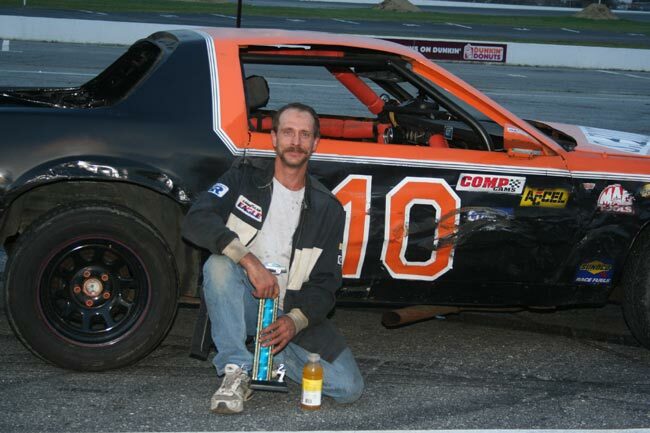 Ripley, who purchased Dale Verrill’s racing operation lock, stock and barrel mere hours after both drivers competed in last Monday’s TD Banknorth 250, dominated his heat and led the first green-flag segment of the main event. 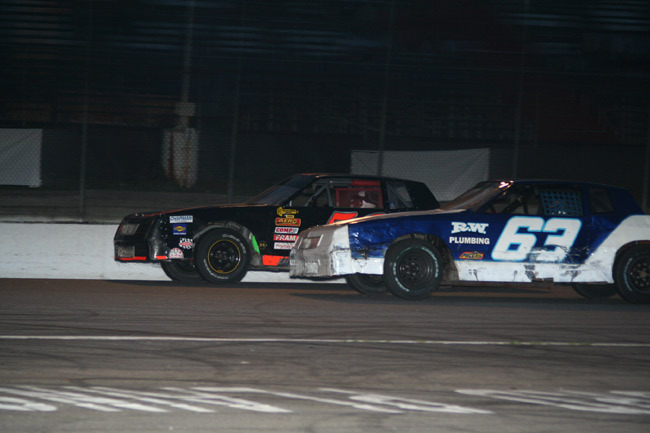 The two leaders swapped the advantage on laps 9 and 10 before Spencer forged ahead to stay on lap 11. Back-to-back restarts on the 13th and 14th circuits brought Spencer back into the clutch of the hungry pack, but he soon set sail while Ripley (inside) and Stearns (outside) dueled over the second spot for the duration. Martin played the waiting game to perfection until Stearns finally fought off Ripley with about five laps remaining. The 2004 champion then wasted no time taking away third from Ripley and seizing second from Stearns in the Bombardier/Oxford Networks #94. “This car is awesome. I’ve got to hand it to my crew,” Martin said. “We’ve just hit on something. We had an awesome run in the 250 and had an awesome run tonight. 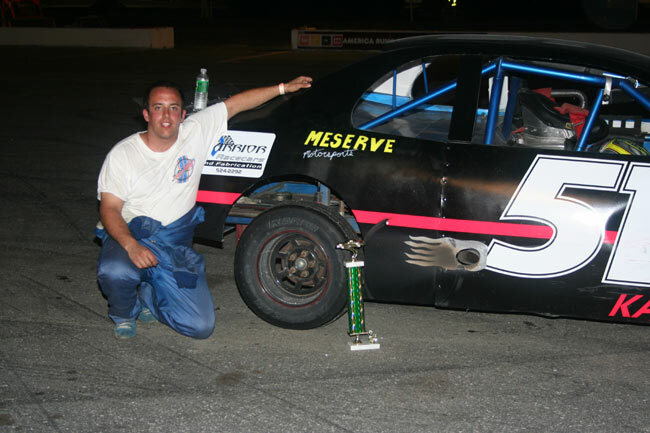 Five days after a third-place finish in the last chance race kept him out of the TD Banknorth 250 in his second try, Stearns rebounded with one of his best runs in the headline division. “We’ve been wrecked about every other week. 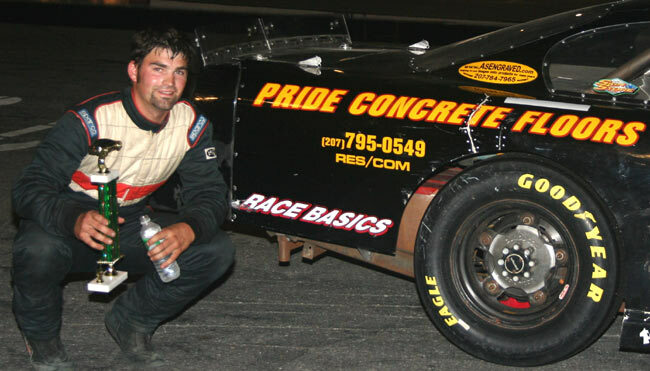 I wasn’t even going to race tonight,” Stearns said of his second trophy run of the season in the Pride Concrete Floors/C.L.H. & Son #85. Spencer ran in the top 10 throughout the TD Banknorth 250, backing up last year’s fifth-place run in the Cole-Man’s Concrete #8 with a ninth in the #95. Several crew members were enjoying a well-earned night away from competition and were forced to hear about their driver’s return to victory lane second-hand. 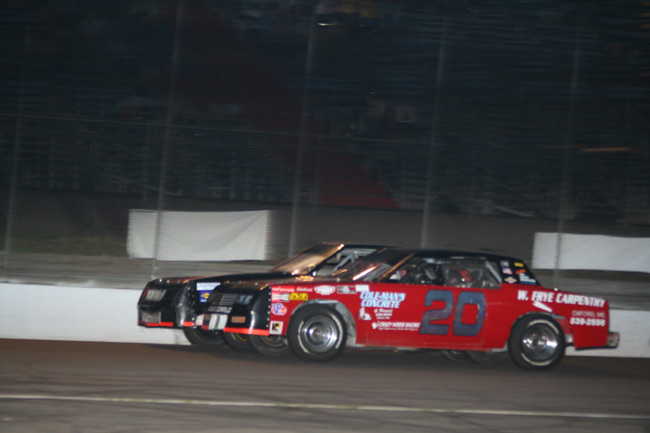 Ripley held on for his best OPS finish, fourth in the Pave-Tek #70, trailed by Hewins. Previous series point leader Ricky Rolfe, winner of five of his last six weekly starts in the top division, sat out the race. He is on a cross-country road trip with his family. 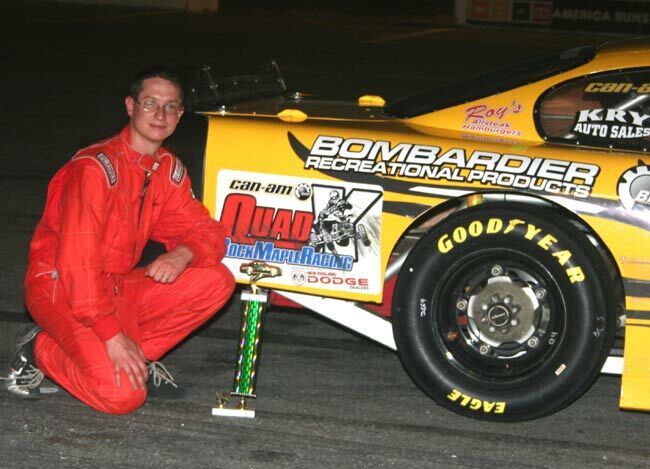 Travis Adams reclaimed the division lead with an eighth-place finish. Martin is now second, a slim 24 points back. Karkos continued his hot streak. After a roller-coaster month of June, the Polymer Repair Technologies #51 has finished first or second in his last four starts. He kicked off the night with his division-leading fourth win of the season, breaking a tie with Don Mooney for the top spot in the Winner‘s Circle Challenge. 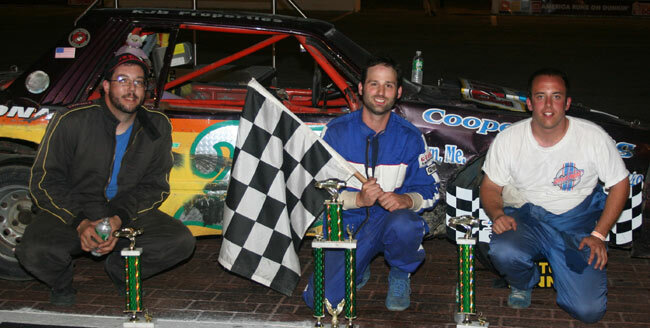 Bishop charged to his best finish of the season in the Cole‘s Custom Auto #08, with Daigle notching the first trophy of his rookie campaign in third. “Can anybody tell I’m hungry tonight?” said Bishop, referring to his late pass of Daigle for the runner-up spot with four laps to go. Winless in Championship Series competition since his first stint as a Mini and Strictly driver in 1991-92, Bishop closed Karkos’ gap to just over two seconds but could only get a distant glance at his rear bumper as the checkers appeared. It inspired him to throw out another rhetorical question. Butch Keene and Darrell Moore completed the top five. As for the yellow Bishop requested, it came with nine laps remaining in the encore. The details simply didn’t go his way. Daigle lost the lead to Bill Childs Sr. on a lap 20 restart. 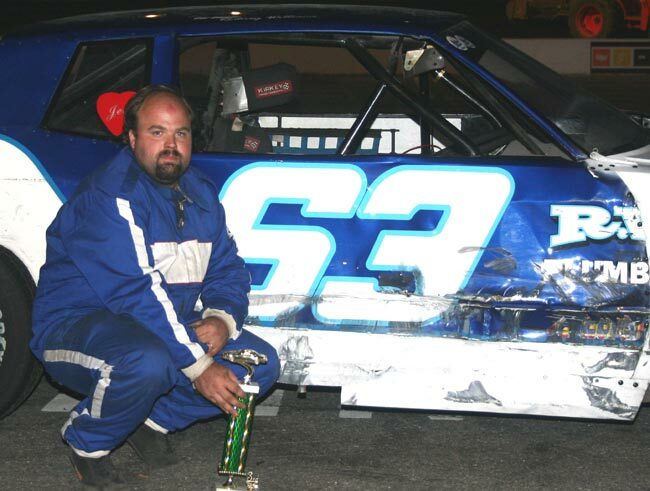 As the leaders raced out of turn four to complete the 22nd circuit, Daigle's front bumper brushed Childs from behind. Childs spun and collected a passing Bill Thibeault, heavily damaging both rides and sending Childs’ #10 back to the garage on the business end of a flatbed. "I feel bad about that," Daigle said. "He's been good to me all year long, and I definitely got into him and spun him. I didn't mean to do it. I'll take the win, but I'm sorry that happened." Because most of the field hadn't completed lap 22 when the caution flew, the scoring reverted back to lap 21. Daigle, who wasn't penalized for his role in the incident, crossed the line second on that circuit and thus was scored as the leader. Bishop had the first shot at Daigle on the restart. 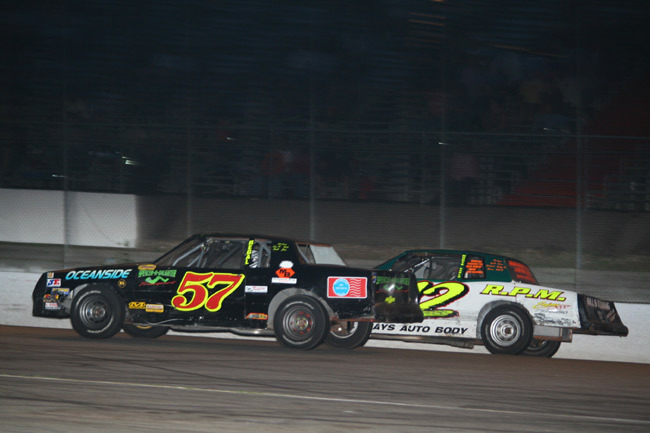 Karkos closed to the leader’s back bumper over the final five laps, but the newcomer held on. "He did a great job," Karkos said. "I know what a big deal that first win is." 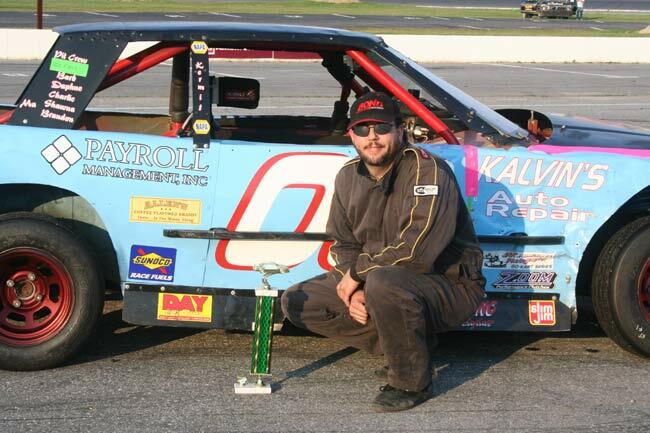 Twice this season, Daigle surrendered the lead to Childs during the final 10 laps of a Mini main event. 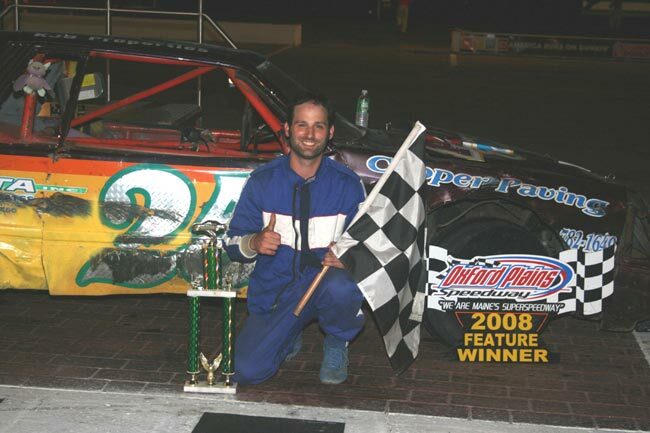 His victory is the first for car owner Wayne Parkin’s team since Parkin himself steered the Le Nationale/Little Joe’s #25 to the top spot on July 3, 2003. 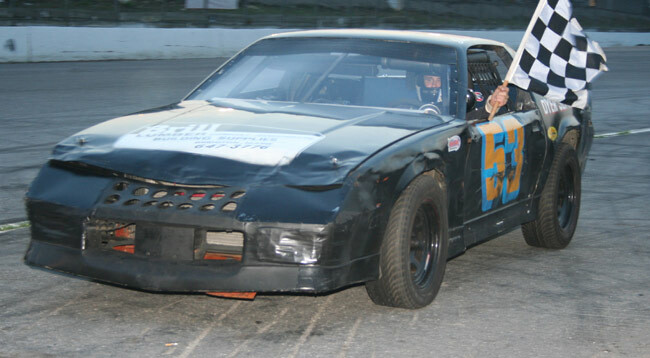 Moore finished fourth in front of Ashley Marshall as those two drivers continue to battle for the series point lead. Marshall now leads by four points, with Bishop third and within striking distance at 39 points off Marshall’s pace. 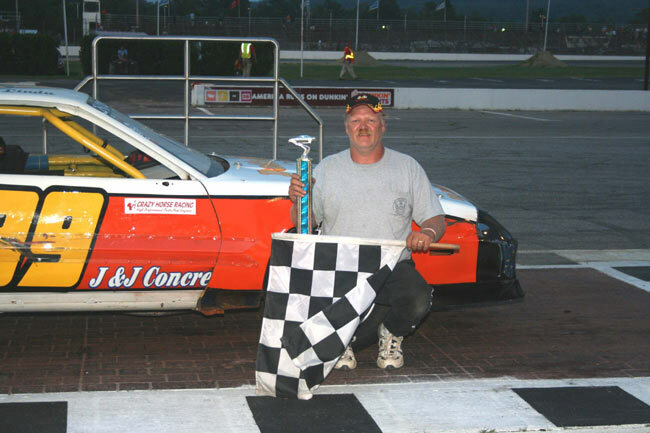 Short now leads all Allen's Strictly Stock drivers with four victories. It took him five laps on the outside of Matt Williams to gain second and another five to dispatch David Tripp, finally picking up the point in the All-Purpose Builders #56 on lap 21. Tripp and the A.J. Levesque Excavation #20 topped Williams in the tussle for second, backed by B.J. Chapman and Larry Emerson. The same could be said for Williams’ crew, who have wrestled with the R.W. 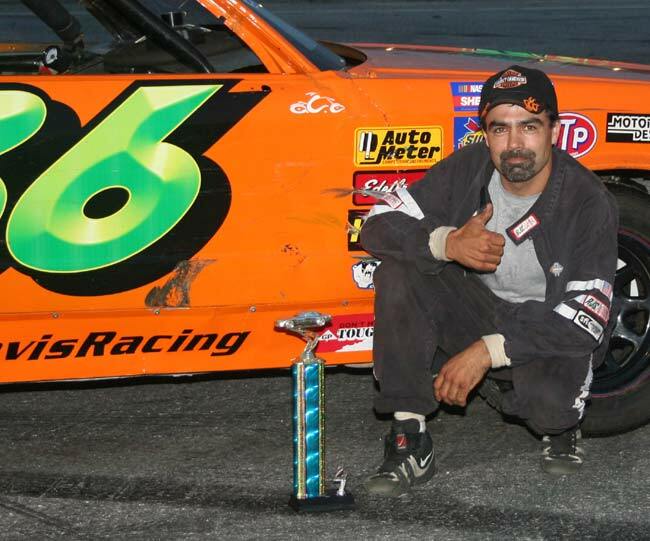 Plumbing #63 all season, helping their veteran driver to second in the series point standings. 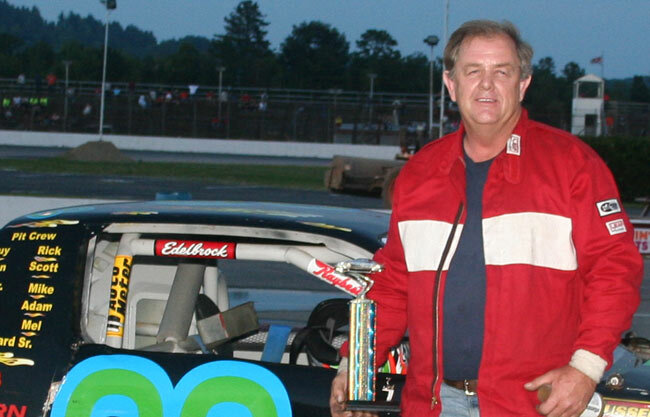 Skip Tripp maintained the division point lead, coupling his qualifying race win with a seventh-place feature finish. Short has won three of his last six starts since July 5. 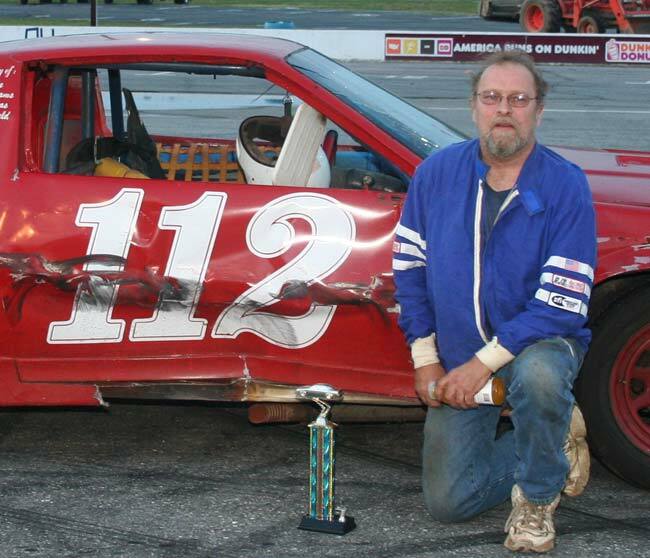 Steve Brill and Jerry Goss ruled two caution-free Chimney Tech Outlaw 20-lappers. Brill hoped to hand over his ride to son Jon for the night. 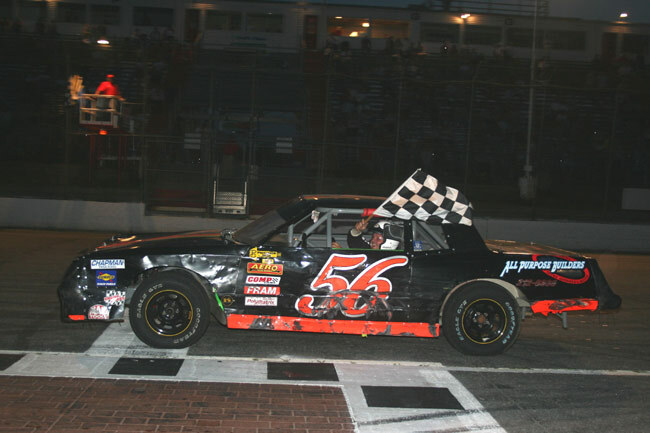 When told that Jon was ineligible because he is a former Strictly Stock champion, Brill roared to the lead on lap 2 and stormed to the victory himself in the Dyer‘s Septic Service/Brill Lumber #53. "I thought it would20be a good idea to get up front and get the hell out of there," Brill said. Scott Ellis and Dennis Morang wound up at the front of a tight pack behind Brill, second and third, respectively, for their best finishes of the season. David Smith and Gerry Richard were next. 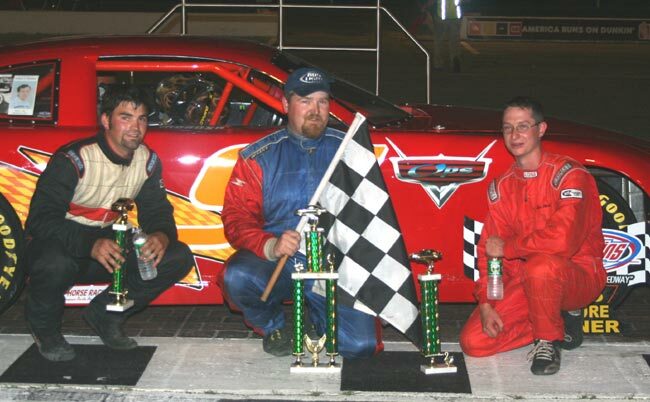 Goss took over from John Patria on lap 5 and extended his lead while Rick Spaulding and David Childs worked the outside of early runner-up Guy Childs Sr.
Spaulding crept within two car lengths but couldn't make the winning move. 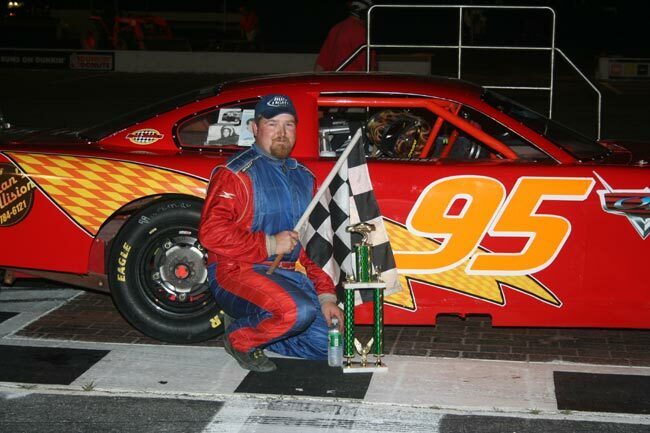 "It was a good night to get out there and lead as early as I could," said Goss, who posted his second triumph of the season in the Dad‘s Place #99. 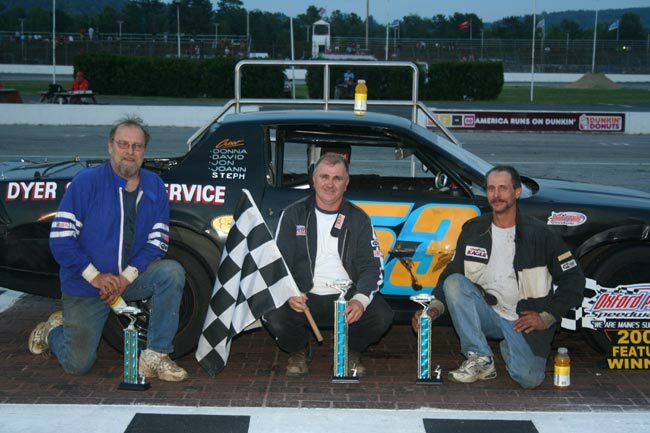 Guy Childs held off nephew David for third at the stripe. Patria picked up fifth, continuing his turnaround from a rough first half to the season. 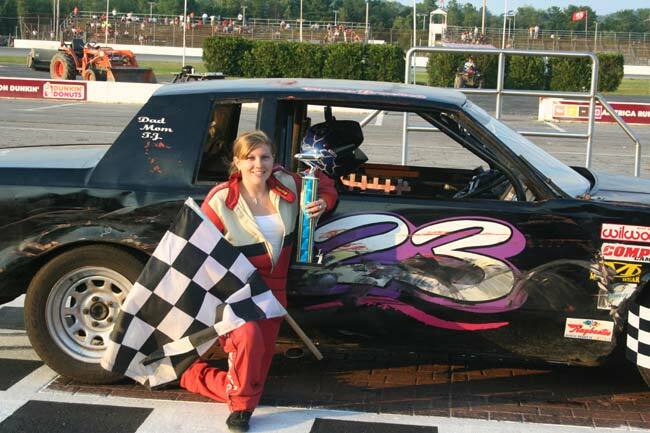 Reigning Allen's Ladies champion Brackett ran and hid from her pole starting position and cruised to her third victory of the season. 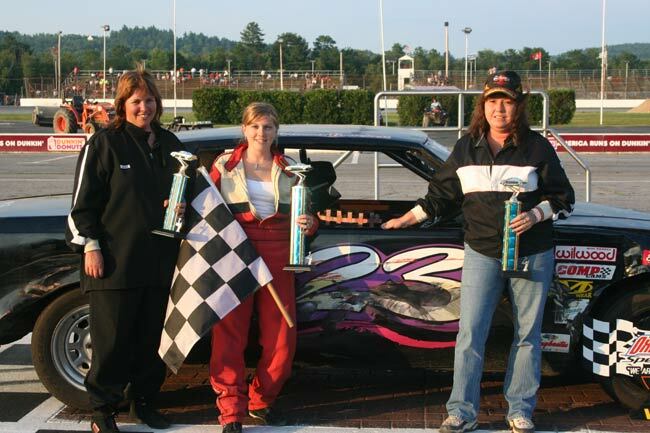 "We never work on the car," claimed Brackett, who was chased to the line by another former champion, Lisa Vining. “I knew I didn’t have anything for her,” admitted Vining, seeking her first win since her 2004 championship season. 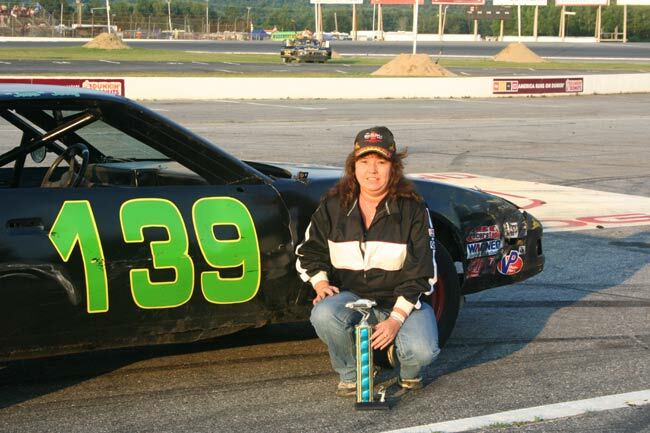 Dottie Patria, currently the point leader on both Wednesday night and in the Agren Saturday Showdown, couldn't make up the lost early ground without a caution and settled for third. Lisa Brooks and Kimberly Sessions followed. 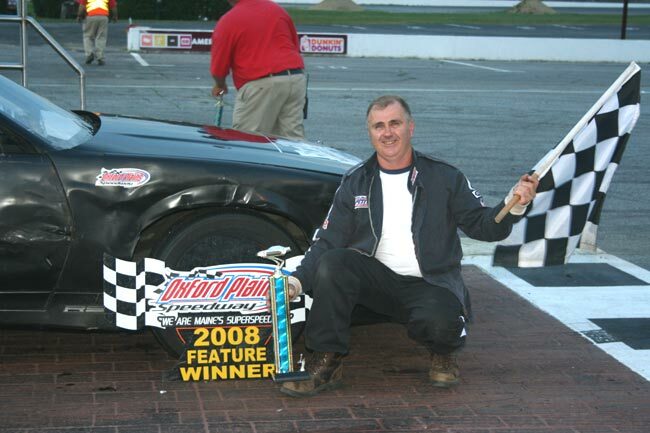 OPS returns to action at 6:30 p.m. Wednesday with the Acceleration Series. 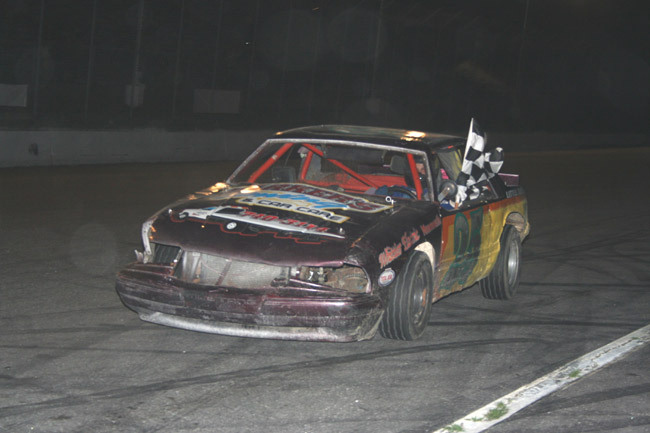 The New England Dodge Dealers Summer Celebration, featuring five divisions of racing and a gigantic fireworks display, is Saturday night at 6:30 p.m. Lap leaders: Ripley 1-8, Spencer 9, Ripley 10, Spencer 11-40. Lap leaders: Green 1-2, D. Tripp 3-20, Short 21-30. Lap leaders: Keene 1-2, Karkos 3-30. Lap leaders: Daigle 1-20, Childs Sr. 21, Daigle 22-30. Lap leaders: Nutter 1, Brill 2-20. Lap leaders: Patria 1-4, Goss 5-20. Time of race: 6 minutes, 41 seconds.